I recall reading at some point several years ago, someone was asking John Byrne if he had a particular page or panel that he was especially proud of. His response was something along the lines of, "Yes, but nothing you're likely to know/recognize." He went on to explain that while the big splash pages and great heroic shots are cool, the stuff that he tended to be proud of were just random panels in which he drew a hand really well. Or an eye. Or a fold of clothing. The small, subtleties that perfectly capture the nature of humanity he was trying to convey at that moment. Honestly, it's not all that great of an illustration. Especially in isolation like this. But for some reason, Vision's left hand caught my attention. First, it has a fairly natural feel to it. The fingers are relaxed and posed in a fairly neutral position. It's not drawn like a mitten with dividers between the fingers, much as I had been doing. Each finger is curled in its own manner and maintains its own integrity. I did get much better at hands because of that panel. Seeing how the fingers all curled slightly differently from one another proved to be something of a revelation for me, and my hand drawings improved substantially. (Although never good enough to be a regular comic book artist, but that's neither here nor there!) 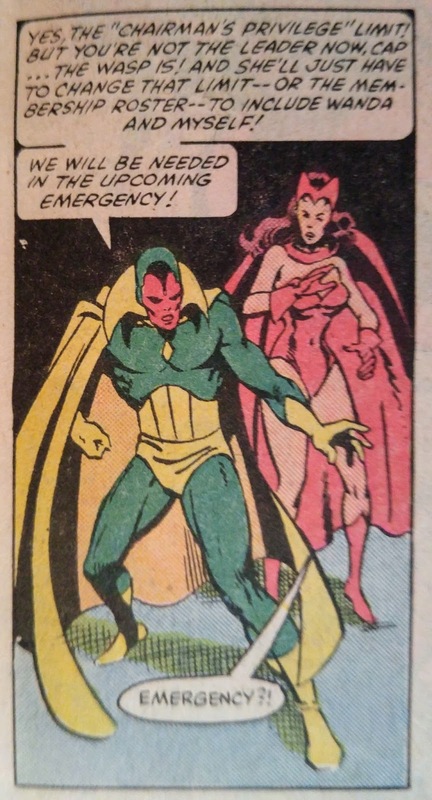 But just from some random panel almost in the background of a superhero story that's probably better remembered as launching the Avengers into the original Secret Wars!